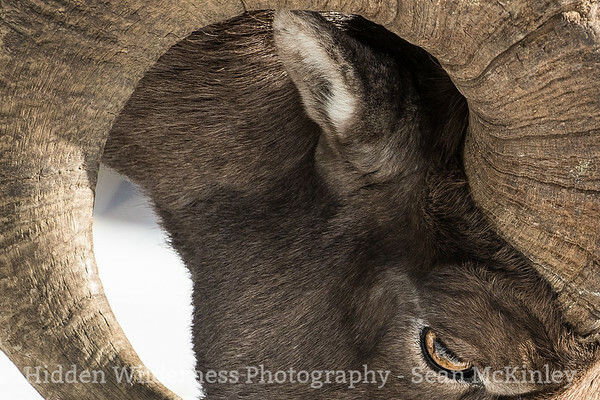 The watermarks on my images are removed at the time of printing, so you will not receive a product with a watermark- only my signature is added to a print, to verify authenticity. As the sun rises, its rays drive back the morning's frost and usher in a fiery brilliance. 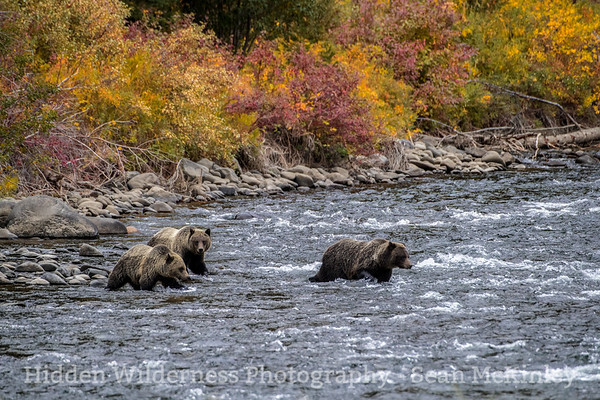 A mother grizzly leads her cubs across the North Fork of the Shoshone River, near Yellowstone National Park. 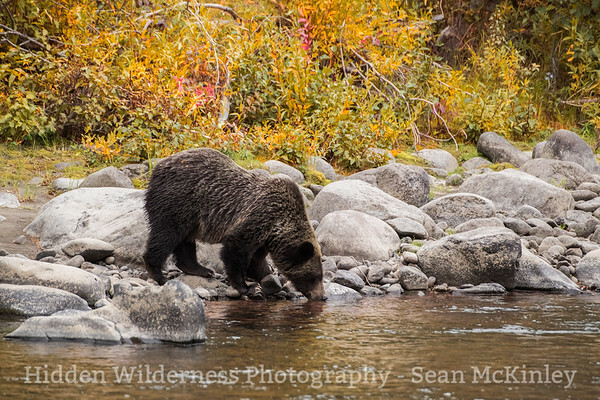 A mother grizzly takes a brief respite from her cubs to drink from a river, taken outside of Yellowstone National Park. 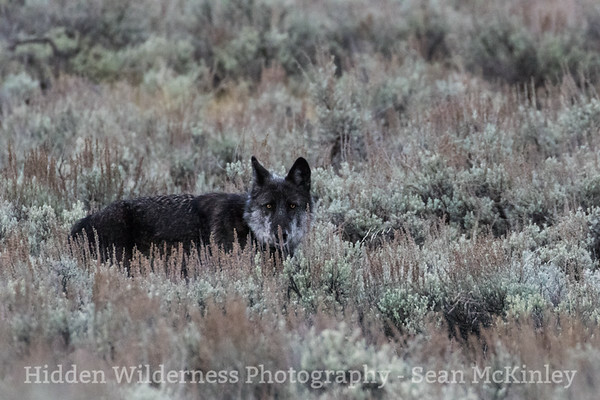 A well fed coyote hunts for rodents in a field in Hayden Valley, taken in Yellowstone National Park. At dawn, an aging fox keeps its eyes focused ahead while it hunts. Taken in Yellowstone National Park. 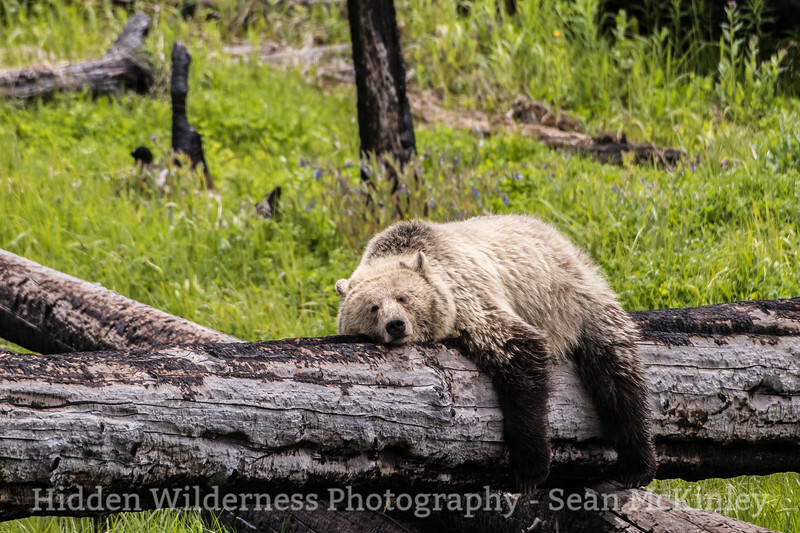 A young female grizzly in Yellowstone, nicknamed "Snow" for her very blonde coat, napping away the afternoon on a log in a meadow full of lush grass and wildflowers. 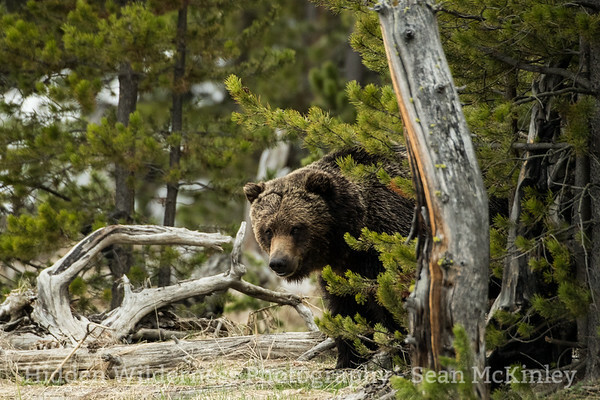 A huge boar grizzly stands behind a grove of lodgepole pine, in Yellowstone National Park. 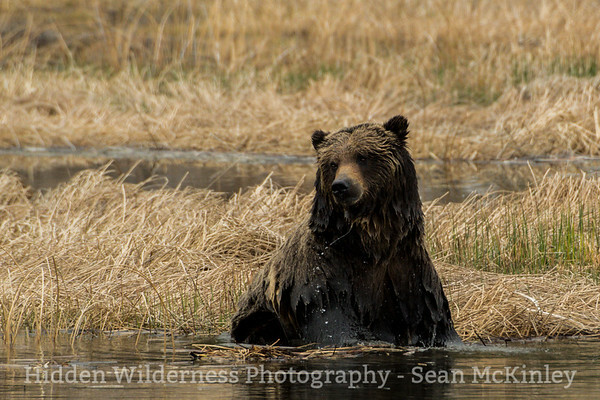 A large male grizzly bear celebrates the coming of spring by having a bit of a bath, in Yellowstone National Park. 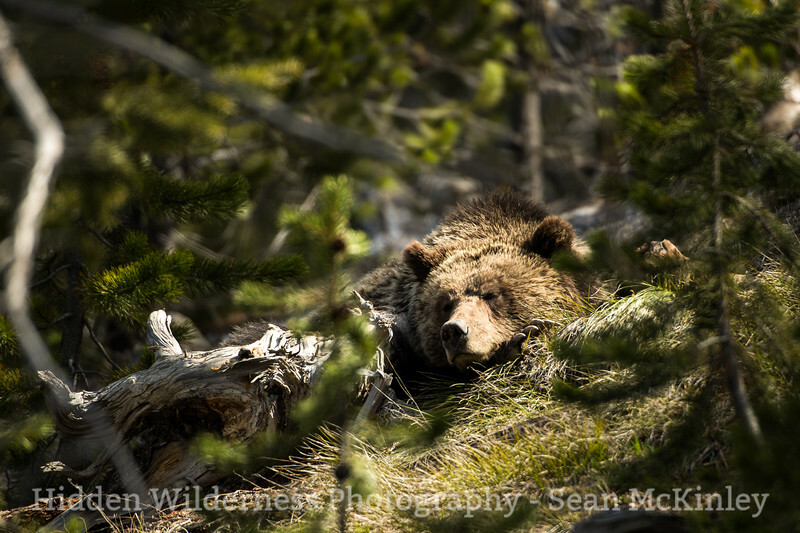 A mother grizzly naps in the sun after a morning with her cub has tired her out, in Yellowstone National Park. 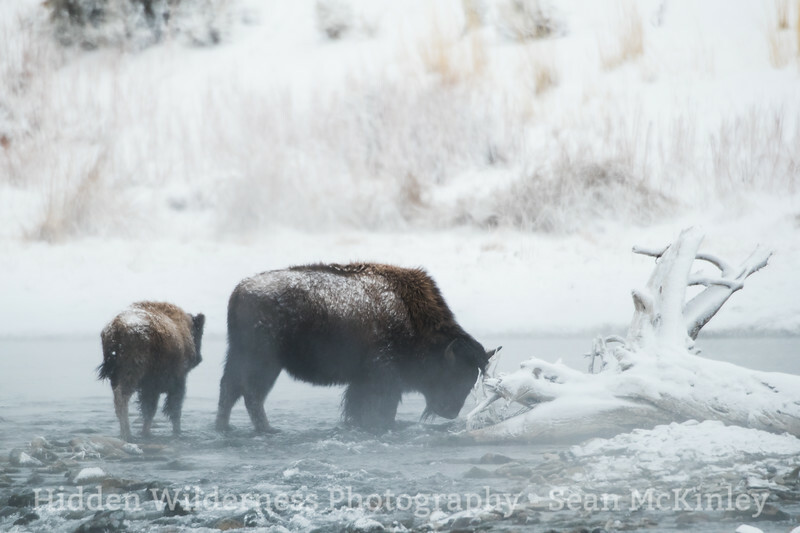 A mother bison leads her calf across the Boiling River, doing her best to safeguard it from the clutches of Winter, in Yellowstone. 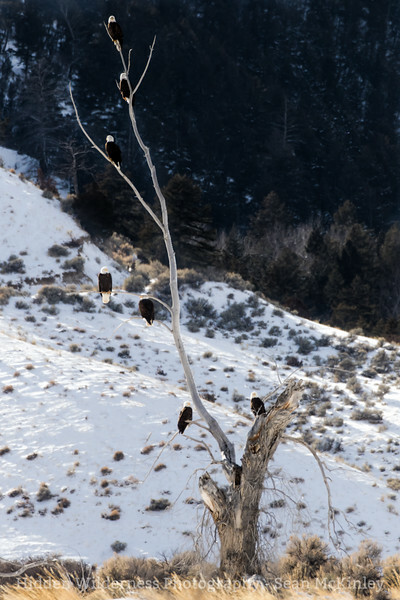 A group of Bald Eagles gather together in a tree, having eaten their fill on a nearby carcass. Taken along the old Yellowstone Highway outside of Gardiner, MT. 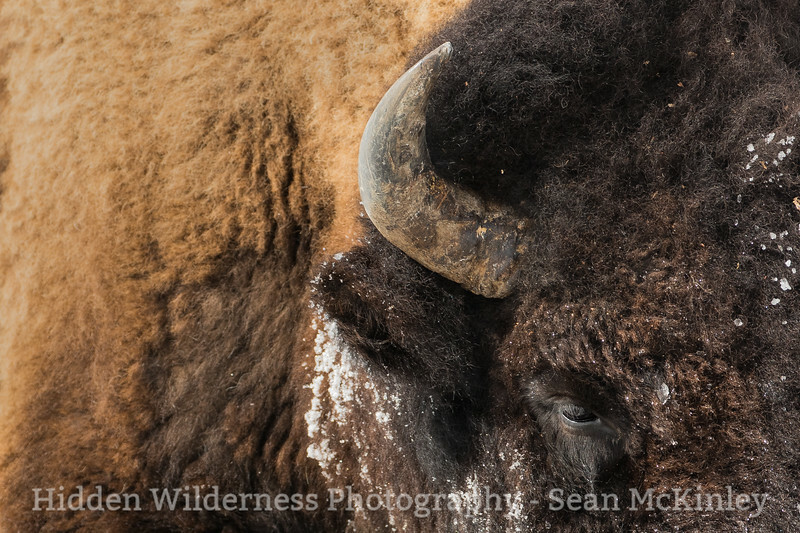 An old and wise bull bison begins his trek back towards Lamar Valley, after surviving another harsh Yellowstone Winter. 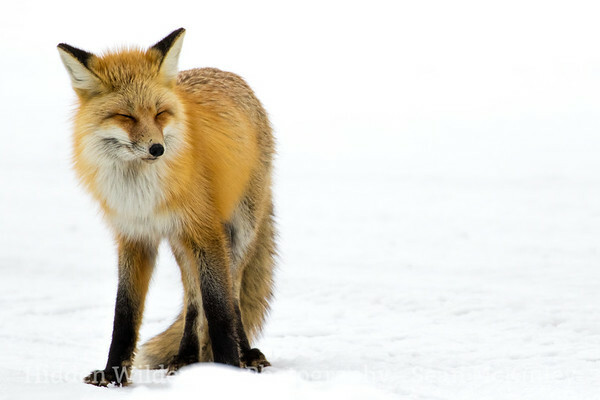 With a full winter coat this fox seemed as happy as can be, even in the dead of winter, in Grand Teton National Park. The once alpha female of the Lamar Canyon pack, crossing Lamar Valley at dawn. A large ram seen during the rut, outside of Yellowstone's East entrance. The aspect ratio on this print is 2:3. 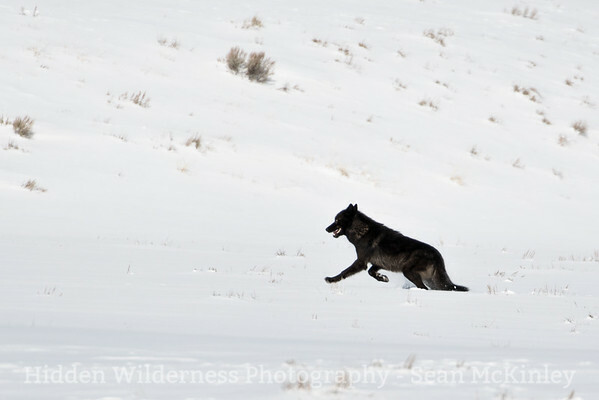 One of the wolves belonging to the Lamar Canyon pack makes its way through the snow, towards the rest of its pack, in Yellowstone National Park. 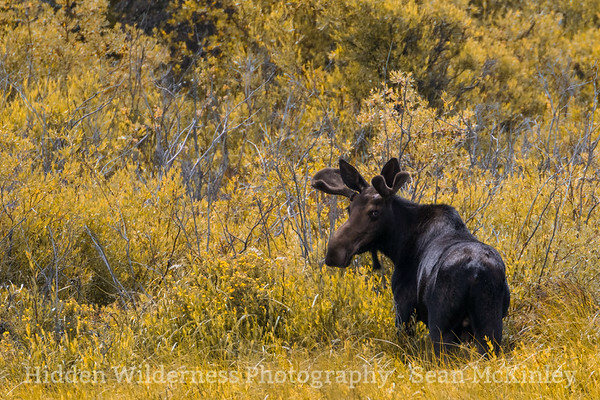 A large bull moose effortlessly weaves his way through a patch of willows, just below Powder River Pass. 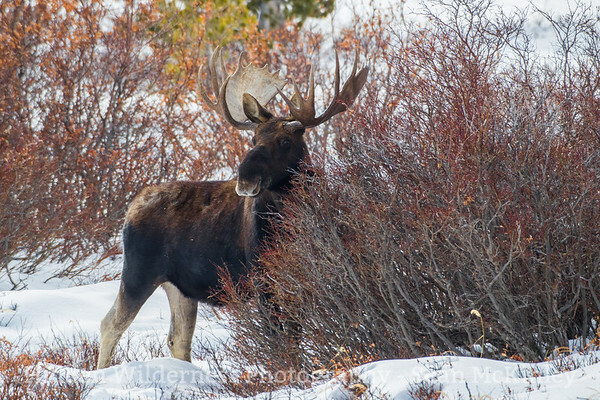 A large bull moose partially hides behind a patch of willows, just below Powder River Pass. 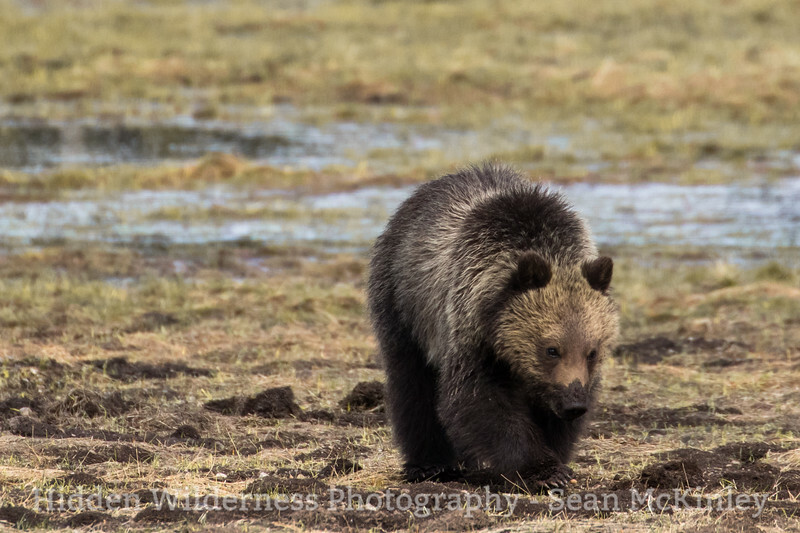 A young grizzly cub digs for grubs and other food in the Spring, Yellowstone National Park. 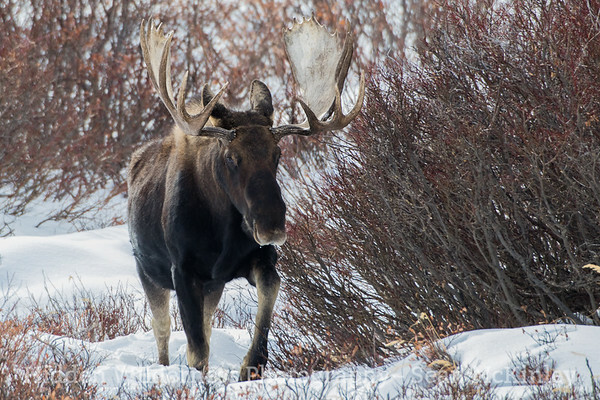 A bull moose casts his gaze at two females making their way into his patch of willows, in Elgin Park. 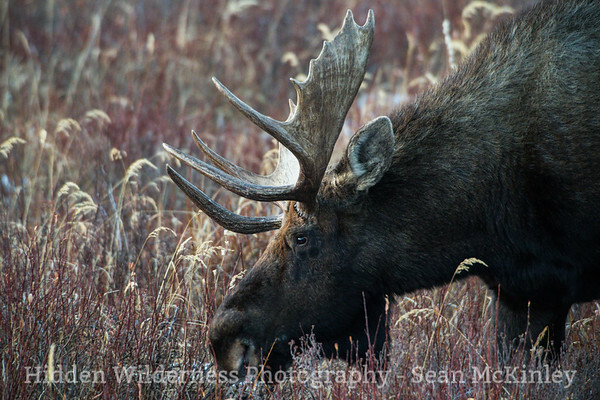 A young bull moose has yet to shed his velvet, in the Big Horn Mountains. 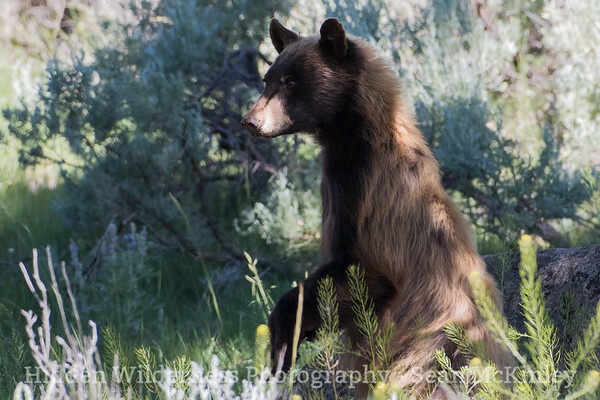 A young cinnamon bear stands tall to survey his surroundings, in Yellowstone National Park. 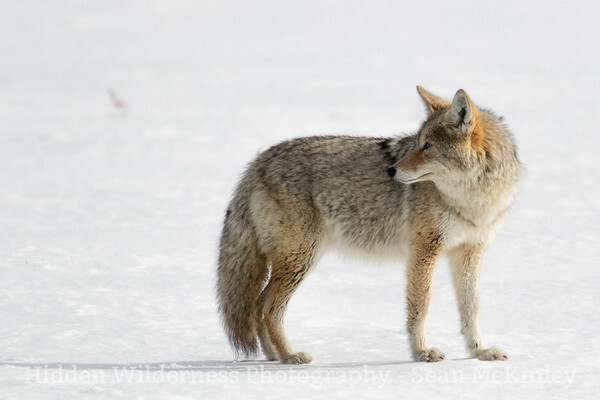 A lone coyote outside of Grand Teton National Park, with a full winter coat. A bull elk leads his harem up the side of a frigid canyon, near Tensleep, WY. A panorama of Lamar Valley at dawn, in Yellowstone National Park. Shortly after sunrise, rays of gold light up the Tetons as wisps of cloud began to lift.